I start seeing and photographing Lizards here in the Ouachitas of Arkansas in March. I have seen some in February if it warms up enough for them to come out of hibernation. I have a wooden deck that they like to sun on and I have to be careful to not step on them. The Prairie Lizard and the Green Anole are the most common Lizards I see here in my area. They are both easy to photograph because they let you get close. I was hand holding my Canon EOS 7D Mark II with the Canon EF 100-400mm f/4.5-5.6L IS II lens. I was shooting in aperture priority mode (AV) with a shutter speed of 1/1000 of a second at f7.1 and the ISO at 800. White Balance was set on auto. I was using single point, continuous autofocus with evaluative metering. I photographed this Bullfrog in a stream that flows out of a pond. The pond is my neighbors but the stream flows across my property here in the Ouachita Mountains. I can see the pond from my deck and in the evenings I can hear the Bullfrogs. This Spring it sounds like hundreds of them. You will also notice that the water in the stream has a rust color. I read that oxidation of mineral deposits cause the oxygen to be depleted. In the absence of dissolved oxygen, the solubility of iron in water usually increases. Since iron is one of the most common elements on the earth it is usually present in the groundwater system. The oxygen in the air oxidizes the iron in the water from the ferrous (+2) state to the ferric (+3) state where it is insoluble. The insoluble iron minerals are rust colored. I was hand holding my Canon EOS 7D Mark II with the Canon EF 100-400mm f/4.5-5.6L IS II lens. I was shooting in aperture priority mode (AV) with a shutter speed of 1/1250 of a second at f7.1 and the ISO at 800. White Balance was set on auto. I was using single point, continuous autofocus with evaluative metering. I photographed this Green Anole back in February of 2016 on a warm day. We have had some warm days these past few weeks and I have seen a Fence Lizard but not a Green Anole. Once the temperature gets up to 70 degrees they should start appearing. I have a cabin that borders the Ouachita National Forest here in Arkansas and I have lots of Lizards on my place. 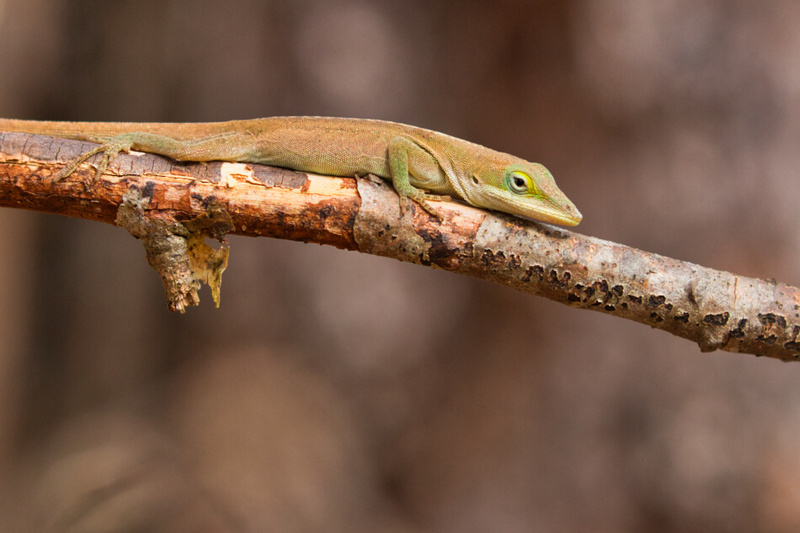 The Green Anoles are fun to photograph and will let you get close to them. The Green Anole in my photo is brown but it can change to a bright green color. The Anole changes its color depending on mood, level of stress, activity level and as a social signal. The typical coloration ranges from the richest and brightest of greens to the darkest of browns, with little variation between. I like having them around my cabin, not only to photograph but to eat the flies. They will eat crickets, grasshoppers, spiders, and flies. I found this Anole by walking around my property with my Canon EOS 7D Mark II camera with the Canon EF 100-400mm f/4.5-5.6L IS II lens. I was shooting without a tripod. I was shooting in aperture priority mode (AV) with a shutter speed of 1/500 of a second at f6.3 and the ISO at 500. White Balance was set on auto. I was using single point, continuous autofocus with evaluative metering.